Care options and facilities vary between villages, please check with your local village. 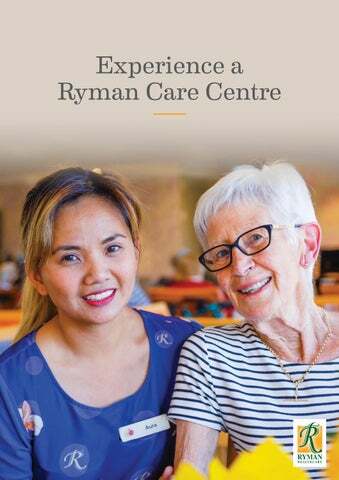 Experience a Ryman Care Centre We’ve put this booklet together to help explain what you can expect if you or a loved one are considering moving into care at a Ryman village. We appreciate that this is an important decision. You will have many questions, and may be a little apprehensive about what lies ahead. three choices at main meals, and emergency power generators at all village centres, care centres and serviced apartments, so you will be safe and comfortable in the event of a power outage. We have tried to answer every question you may have, and to make this booklet as simple as possible, so there are no surprises. We want you to be conﬁdent that you have made the right decision – even if you decide that what we oﬀer is not right for you. That’s perfectly understandable, but I’d like to assure you that you are in good hands. My ﬁrst introduction to Ryman was when my Nana was a resident at Margaret Stoddart Retirement Village in Christchurch. She loved it, and my family and I were delighted with the care she received there. If there is anything you are worried about, or any questions you have after reading this booklet, don’t hesitate to ask our team. Or even better, come and visit for a cup of tea or lunch, and talk to our residents and staﬀ, they’ll be very happy to chat. We regard looking after older people as a great privilege, in work and in life. Therefore, if you do choose to make a Ryman village your home, welcome, we look forward to looking after you. For us this starts with a fantastic team of well trained and resourced staﬀ who put kindness at the heart of everything they do. They are there to make the move into your new home as easy as possible. The best of care for both of our Dads For Peter and Susie, if they could pass on one message to others from their experiences in having both of their Dads in care, it would be to talk about the future early. It’s only natural to want to savour the ‘now’ and let the future take care of itself. Those perceptions of ‘oh, I don’t want to go into a resthome’, or ‘no, we’ll be alright’ are very common and understandable. But for Peter and Susie, having discussions with family and educating themselves on what care facilities were actually like, was a game changer in helping them provide the best of care for both their Dads. The village was able to organise a room for Rob with a view of the water. Two weeks later he moved in. Susie’s journey with her Dad began when a doctor’s visit conﬁrmed that Rob would need resthome level care to manage his Alzheimer’s condition. Rob was living in the family home in Wellington, and Susie found herself having many sleepless nights worrying about him. She began looking at resthome facilities in Auckland so that Rob could be closer to her and Peter. The care centre at Grace Joel Retirement Village was one of the facilities they looked at. After talking with the village manager about the anxiety and pressure she was feeling, he invited Susie and Rob to come for a visit. “From the minute I walked in the door, this place felt really good. I have a bit of intuition about these things being a nurse, but it felt really good,” Susie recalls. Susie and Peter pictured above and left with Peter’s Dad, Gordon. “I thought: ‘Do I know this man? I don’t think I’ve met him before, sitting there in the lounge with a big smile on his face, joining in with the exercises! All my life I’ve never known him to be this content.’” issue, and when his licence was taken away, Peter said it was like taking away a piece of his Dad’s freedom. Once again, Grace Joel staﬀ suggested coming along to afternoon tea at the village, so he could get a feel for village life. “It was a quick decision after that.” Peter explains, “Gordon was pretty happy.” It was important to Peter and his sister Jill that the decision was their father’s. They may have prompted it, and opened the door to Grace Joel, but it was ultimately his decision. In fact, in a lot of ways it has given him back some control of his life, as he is making decisions for himself, however small. He enjoys the company of the other residents in the lounges, but if he decides he would rather be by himself, that’s up to him. What Gordon enjoys the most is watching the rugby, yachting or anything sport related on Sky Sport. And so, when it came time to ﬁnd a home for her husband Peter’s Dad, Gordon, Grace Joel was top of the list. He also decides what he wants to eat, with the choices available on the Delicious menus. “He’s put on 3kgs since he’s been here, so he’s never been in better shape,” Peter says. What was surprising for the family was how quickly Gordon moved on from his old life. Susie recalls one of the funniest moments was when Jill came to visit. Her reaction upon seeing him was priceless. The peace of mind meant a great deal to both families. For now, Gordon is looking to the future and is relishing the fact that he recently became a Great-Grandad. Which means a great deal to him. For both Rob and Gordon, once they came to live at Grace Joel, all the uncertainty went away. For Susie, she was able to give Rob the support and love that he needed. pager is linked speciﬁcally to their primary group, ensuring a prompt call bell response. Upon arrival you will be welcomed into the fold of the care centre, where smiling faces, warmth and kindness are in abundance. We understand that this can be an unsettling time, so we take our time and we listen. Every resident is unique; therefore, care is individualised to suit your needs. You will not only see the care and kindness, you will feel it. Our staﬀ are on hand to help with all your needs, from showering and assistance with dressing through to administering medicines. Our in-house doctor visits the village 2-3 times a week, or if you prefer we can arrange for you to keep your own doctor. Medication administration is managed electronically through 1CHART, ensuring up-to-the-minute prescriptions and recording. Our electronic care programme, myRyman, enables us to develop a detailed plan of care with you and your family. This will determine the level of care you require, including your own personal preferences – right down to how you like your cup of tea. To complement this, we implement primary nursing groups. This means that registered nurses and caregivers are allocated to a group of residents – so you will be regularly cared for by the same person. You will ﬁnd that we are driven by what works for our residents. In addition to the regular feedback we receive, our care team will meet with you and your family to review your plan of care. Care options Our levels of care are resthome, hospital, dementia, and respite care. Your needs will be assessed before your arrival with us to ensure that you are receiving the level of care that suits your needs. Our hospital-level care provides for those who have signiﬁcant medical needs. Most people in our hospital require full assistance to move around. We will assist you with all your needs, from showering and dressing to monitoring any chronic health conditions. We will also provide assistance with medications, wound care, continence management and any other health needs as required. With this extra help, daily life carries on as normal. The activities and outings are all there for you to take advantage of, and we encourage you to make the most of what the care centre has to oﬀer. Care is provided by trained caregivers and registered nurses, and is overseen by unit coordinators and a clinical manager. A registered nurse is always on duty in the hospital, and while it is not an acute hospital, our on-call doctor service is always available. With our primary care groups, wherever possible, the same staﬀ members will care for you each day. Care is provided by trained caregivers 7 days a week, with oversight by registered nurses, a unit coordinator and a clinical manager. Our primary care system also ensures that wherever possible, the same staﬀ members will care for you each day. Each resident is unique, so by listening to your needs, we can customise your care. For instance, we oﬀer resthome level care in the comfort of a serviced apartment. This allows you to remain in your own apartment, but with the extra support that you need. Respite care is available to provide carers with a break, or for rehabilitation following a hospital stay. Whatever the circumstance, respite care provides care for as long as you need, whether it’s for a single night or for a few weeks. The homely environment and feeling part of the community at our care centres, oﬀers a welcome change for those who are normally living at home – often alleviating feelings of loneliness and boredom. The units incorporate many unique design features to help residents ﬁnd their way around, such as interesting wall decals and textural wall ﬁttings. On each resident’s door a memory box has been ﬁtted containing special possessions that help them recognise their room. Residents are monitored within their rooms by a discreet sensor system which alerts staﬀ if residents are out of bed at night. The system switches on lights which direct the resident to their ensuite, and then back to bed. Day Care Our day care programme can accommodate those who would like to join us during the day, to enjoy meals and activities with other residents. Our priority is to listen to your individual needs and to customise our services to create a happy outcome for everyone. You may be eligible for a subsidy to cover a number of day care days per year, or you can elect to pay privately. The open plan dining room and lounge area encourage freedom of movement. Our residents can also walk around our specially designed secure outdoor courtyards and garden areas. Art, music, aromatherapy and exercise are some of the activities we include in our extensive activities programme. This programme is scheduled 7 days a week and supports all degrees of physical and mental dependency, and has a positive impact on our residents’ quality of life. Activities are shorter in duration, but are scheduled more frequently for variety and to avoid long periods of concentration. Our centrally located nurses’ station and closed-circuit monitoring system enables staﬀ to non-intrusively watch over residents while preserving their dignity. Our staﬀ are well trained in dementia care and care for residents in a positive and therapeutic manner. About Ryman Healthcare Established in Christchurch in 1984, Ryman is a New Zealand-based company that draws on over 30 years of experience to provide the best retirement living and care options for our residents. We are guided by the strong governance skills of our board, and draw on the depth of experience from Ryman’s senior executive team – where the average tenure is over 10 years. Our Board of Directors is chaired by Dr David Kerr, who joined the board in 1994 and is a respected medical practitioner. Our company has expanded to Victoria and currently has over 30 operational retirement villages in New Zealand and Australia, providing homes for over 11,000 residents and employing more than 5,000 staﬀ. 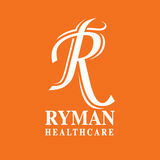 Ryman has an unprecedented reputation for building exceptional villages and employing professional and caring staﬀ. We grow organically by establishing new villages on greenﬁeld sites oﬀering resort-style facilities. We provide care options to suit resident needs from independent living and serviced apartments, to resthome, hospital and dementia care. Ryman is one of the largest listed companies in the NZX, and has a strong balance sheet. Many shareholders are also residents, which is testament to the level of trust they place in us. As a publicly listed company we are subject to stringent governance requirements and signiﬁcant external scrutiny. Certiﬁcation Over 60% of Ryman villages have been awarded 4 years’ certiﬁcation, which is externally audited for the Ministry of Health. This means that the sector standard for aged care has been exceeded, and it is recognised as the ‘gold star’ standard of care quality. The Clinical Governance Committee assists the board of Ryman Healthcare by supporting and enhancing the quality of the company’s clinical performance and care and service provision. They assist the board in its oversight of clinical reporting and compliance and are focused on innovation and ensuring alignment with emerging best practice. Certain aspects of our villages are often highlighted as going above and beyond – such as Delicious, where meals are prepared fresh on-site, oﬀering a number of meal choices and an abundance of ﬂavour. Other areas we have been recognised for are the ACC accredited, award-winning Triple A exercise programme, and our compassionate approach to palliative care. The committee consists of three non-executive directors: George Savvides (chair), former MD of Medibank; Dr David Kerr, a GP and past president of the New Zealand Medical Association and Jo Appleyard, a lawyer. Tim Wilkinson, a professor at Otago Medical School and geriatrician, provides specialist input for the committee. In addition to external audits, we also have a rigorous internal auditing programme. Our staﬀ are trained in emergency procedures, and emergency drills are held every 6 months. We have speciﬁc procedures in place in the event of a disaster or emergency. Many of our villages are already smokefree and we are committed to being completely smokefree in all Ryman villages by 2025. Ryman Moves All facilities and private rooms are ﬁtted with comprehensive smoke detectors and sprinklers that are operated by an alarm and monitored by staﬀ. All staﬀ at Ryman villages undertake ‘Ryman Moves’ training, which provides the correct and safe techniques for moving and handling residents. The training is based upon the guidelines produced by ACC, and is designed to minimise the risk of injury to staﬀ and residents during moving and handling. At Ryman we are constantly reﬁning the services and facilities we provide, which is why we have invested in the installation of generators in every Ryman village. This includes serviced apartments, care centres and village centres. We’re not required to do this, but we see it as a prime example of putting our residents ﬁrst. So, if a power outage occurs, our generators will kick in to keep both residents and staﬀ safe and comfortable. Training involves techniques for safe moving, handling, sitting and standing. Training also covers how to assist with walking and moving residents while they are in bed, and what to do in the event of a fall. Training in speciﬁc areas is ongoing. The key to maintaining happy residents, family and staﬀ is communication. We ﬁnd this is the case in every aspect of life. Therefore, we provide a number of ways in which we keep you up to date. Since 2014 Ryman have been repeatedly named the Most Trusted Brand in the retirement sector as voted by New Zealanders. These accolades are recognition that we are doing right by our residents. For care updates and general information, we communicate in person, via phone call, email, text or voicemail, and hold relative and resident meetings every 6 months. Our myRyman tablets provide a detailed history of each resident which is updated daily. If you need it, we can provide an update at the touch of a button. In a sample of comments, Ryman was described as having kind staﬀ, fair charges, providing excellent care and villages that residents love living in. Quality Service Ryman Healthcare have been awarded the gold medal four times in the Reader’s Digest Quality Service Award, as the retirement village operator that Kiwis believe best demonstrates excellent customer service. Families can keep up with what is happening in the village through our monthly Village Connection e-newsletters. We also deliver an activities calendar to your room each month outlining the entertainment and activities scheduled each day. Residents, their families and staﬀ are regularly surveyed to ensure standards are maintained across the board. Private rooms Your private room and the care centre lounges are your home. Our priority is to help you feel at home, and as content and relaxed as possible. We aim to get the right balance of providing you with the privacy of your own room and ensuite, along with the social and entertaining aspect of the care centre. Private rooms are spacious and there are a selection of room layouts, so you can choose which one is right for you. You will also enjoy a private ensuite and television. Whatâ&#x20AC;&#x2122;s important is that it is your own personal space, with the scope to personalise it with your own furnishings and belongings. It all combines to create a haven for you to relax in, with many rooms overlooking beautifully landscaped gardens, courtyards or atriums. There is plenty of space to welcome visitors and some rooms feature an alcove that can accommodate a display cabinet, storage or a small fridge. Room layouts and amenities vary, please check with your local village. The culture at Ryman Healthcare is about empowering staﬀ to continue to improve our standards of care. Our drive is to lead the charge in retirement and aged care – to set the bar and continue to raise it. What does this mean for you and your family? One of the major advantages is that myRyman includes staﬀ rostering, which means that your care is linked directly to how we plan our staﬃng. Therefore, for instance, should a regular nurse or caregiver be absent, the new caregiver can access your full history at the touch of a button. myRyman is an electronic care application which is accessible on a tablet located in every resident’s room. It has revolutionised the way we assess, plan, deliver and evaluate our care. Plus, updating progress notes is signiﬁcantly more eﬃcient. This means nurses and caregivers can update your records in real time as they are caring for you in your private room. It’s the little things that make a diﬀerence to an older person’s life – how you like your tea, the topics that spark your interest, the achievements that you’re most proud of, and the family members you hold dear. In capturing all information on one easy-to-access tablet, we are personalising your care, further enhancing the easy lifestyle at Ryman villages – not to mention making nurses and caregivers very happy at the same time. myRyman is the result of our constant drive to innovate and improve. We recognise that people do not become nurses and caregivers so they can complete paperwork. Their vocation is to provide the best care, by building relationships and trust through quality time spent with their residents. By dramatically reducing the time spent completing paperwork, Ryman care staﬀ can spend more quality time doing what they do best – caring for residents. It has revolutionised the way we manage our care. In 2017, we launched our Delicious menus. Our aim was to shake up our approach to food and how it is delivered. To achieve this, we literally went back to the drawing board to survey what our residents’ preferences were. Don’t just take our word for it, sample the ‘Deliciousness’ for yourself! Join us for a meal to obtain a true appreciation of the abundance of ﬂavour and the choices on oﬀer. Sample Menu With input from our residents, we captured the essence of what is really important to them. In our care centres this is especially important, as all meals and snacks are provided. Cravings for old favourites are satisﬁed by providing the comfort of the classics, but we keep it ‘fresh’ with innovative choices. Think roast chicken or baked teriyaki salmon with a soy and ginger glaze. Breakfast Variety of cereals/porridge/fruit/toast and selection of spreads. Morning Tea Aunt Daisy’s southern cheese rolls. Lunch Baked ﬁsh with lemon and thyme crumb or roast pork belly with red pepper sauce. Scalloped potatoes with steamed carrots, broccoli and orange hollandaise. Vegetarian Option Penne pasta with creamy tomato sauce, olives and capers. Dessert Vanilla proﬁteroles with berry coulis or fruit with ice cream. Soup Roast carrot and coconut. Recipes provide variety, freshness and ﬂair. There are three main course choices, including a vegetarian option, and the ability to cater for special dietary requirements. There are three menus per year that change to reﬂect the seasons from autumn, winter and summer. So, you can look forward to hearty roasts in the winter, the freshness of summer fare, and everything in between. We serve up 120 diﬀerent meals per month, so the same meal does not reappear for 4 weeks – unless of course it’s back by popular demand! Afternoon Tea A selection of fresh fruit and sandwiches with cakes/slices or biscuits. Evening Meal Chicken cakes with guacamole and salsa or macaroni and cheese. Traditional lettuce salad with Highlander dressing. Supper Tea, Milo or cold drinks. Small sandwiches, light mufﬁns or biscuits. We’ve made the midday meal the centrepiece of the day. Our enjoyment of food is vital, not only for nutritional reasons, but for many, coming together for a meal is a highlight – providing an event to look forward to and an opportunity to connect. Your relatives and friends are welcome to join you for a meal at any time. Vouchers are available to purchase at reception. Ryman Engage Ryman Engage – our complimentary activities programme – is about embracing opportunities and activities that are thoughtfully planned, age and ability appropriate, and make the most of our beautiful facilities. organise activities that inspire movement such as active games like quoits and indoor bowls. The aim is to create a sense of purpose and to showcase talents. What is most important however, is having fun and getting involved. Ryman Engage covers all aspects of wellbeing considered important for quality of life. These include physical activity, social engagement, intellectual stimulation, creativity and embracing culture and spirituality. The key is to provide something for everyone. You will ﬁnd choices like puzzles for intellectual stimulation, arts and crafts for creativity, and outings in the village van to provide social engagement. A ﬁrm favourite among residents is the complimentary Happy Hour. Regular entertainers perform for residents, which they thoroughly enjoy. In fact, we often have relatives who come along to join in the fun. Activities are also speciﬁcally tailored for our dementia care residents. Art, music, aromatherapy and exercise are some of the activities we include in our extensive activities programme. Ryman Engage supports all degrees of physical and mental dependency, whilst having a positive impact on quality of life. Ryman Triple A The Ryman Triple A exercise programme is ACC approved and accredited. It was introduced in 2007 to encourage you to feel better, improve your strength and mobility, and reduce the risk of falls. As a care resident you may not have the same active skills you once did, however it does not mean that exercise and movement are no longer a necessity! In fact, you could argue it is even more important. The social aspect is also a key advantage, where you can gather together and feel a sense of purpose and more often than not, have a good laugh and get to know other residents. The frequency of Triple A classes varies between villages. However, they are generally held 2-3 times a week for resthome residents. For hospital and dementia care residents, classes are available every day. Triple A is based on the belief that you are never too old to exercise – you’ve just got to choose the right way to do it. Therefore, the level of participation is up to you – you can be as involved as you want to be. There are classes such as functional ﬁtness and circuit, and for those who are less mobile, a sit and be ﬁt class. There is certainly something for everyone. You are never too old to exercise – you’ve just got to choose the right way to do it. Facilities As a care centre resident you have access to beautiful spacious lounges, dining areas and serene outdoor spaces. Living areas are warm and inviting, and provide the perfect setting to meet with family and friends. The resort-style facilities can include a hair and beauty salon, cafĂŠ and shop. Our villages have beautifully landscaped gardens where you can enjoy peaceful strolls or have space for the grandchildren to play. For your peace of mind, we have security patrols throughout the night and there are staďŹ&#x20AC; on-site 24 hours. Our friendly housekeeping team attend to your room. On weekdays they vacuum, dust, declutter and remove rubbish. They will clean your ensuite, and will wipe down all surfaces. We have a full commercial laundry on-site to attend to all your personal laundry needs. Our in-house labelling system ensures you donâ&#x20AC;&#x2122;t need to worry about labelling your clothes as our laundry team attend to this using their thermal press at no charge. Our caregiving team will provide you with fresh towels daily and your linen is changed weekly and as required. Each day you or your carer will place your laundry in your personal laundry bags in the morning. You can expect your clothes to be returned to your room within 24 hours. Once a week the team will give your room a thorough clean, so your private space is always fresh and inviting for you to enjoy. We can arrange dry cleaning oďŹ&#x20AC;-site for you at your own cost. A guide to moving into the Care Centre First and foremost, talk to us so we can guide you through the process. We also ﬁnd that seeing is believing in putting to rest any anxieties you may have. Visitors are encouraged to join us for a meal and to take part in some of the activities. Ultimately you need to feel at home with your choice of care centre, so immersing yourself in the typical daily activities and environment is the best way to start. Staying at the village for a few days in respite care is a great way to get a true appreciation of village life. You need to be assessed by your local Needs Assessment and Service Coordination agency (NASC), or in some regions Care Coordination – Older Person’s Health, to ﬁnd out if you are eligible for residential care. You can arrange this yourself or someone else such as your GP can arrange it for you. To get in touch with NASC, call Seniorline on 0800 725 463, or for your local NASC visit www.nznasca.co.nz/regions. Costs vary according to your needs and the type of room layout you choose. An assessor from NASC or Care Coordination will visit you and talk to you about your lifestyle and care needs to work out the best care option for you. Once you have been assessed, you will receive a letter to let you know if you are eligible for care services, and what level of care and government assistance you may be entitled to. Once you have been assessed as needing care, you can apply for a residential care subsidy. This subsidy is asset tested by WINZ and the asset thresholds are adjusted yearly. If your assets are below the asset threshold, you qualify for government funding. WINZ will then assess your income and tell you how much you will need to pay towards the cost of your care. If your assets are above the asset threshold, you pay the cost of care. If your assets fall below the threshold during your time in care you will become eligible to apply for the residential care subsidy. Seeing truly is believing – there is no better way to obtain a true reﬂection of care centre life. We can even arrange transport for you if necessary. Room premiums At Ryman villages our premium rooms provide superior accommodation in the form of a larger room and/or an ensuite. It is important to remember that feeling nervous and apprehensive are a normal part of the settling-in process. You can take comfort in the fact that you will be entering into a village community where other residents have faced the same changes you are experiencing. Not to mention you will be surrounded by the caring support of the village staﬀ. The room premium amount is speciﬁc to the type of room you select. This will be fully outlined in your admission agreement, which we will explain to you in full. If you have any further questions about how room premiums work, our village manager will be happy to answer them. Focussing on establishing a new routine and familiarising yourself with all that the care centre has to oﬀer are great ways to keep yourself occupied in those ﬁrst days and weeks. Remember that having the privacy of your own room allows you to enjoy the peace and quiet of your own surroundings. Step 4 Applying to move in Prior to moving in, you or your representative will need to sign an admission agreement and provide information about your personal circumstances and preferences. Make it your own Setting your room up in your own way is one of the best ways to help you feel at home. You are welcome to bring your armchair or your favourite pieces of furniture. Display your personal belongings around you, creating comfort in the familiar and helping you feel more at home. It is important for us to know this information so we can give you the best possible care and quality of life. We understand that privacy is important to you, and at all times your information will be treated with sensitivity and kept conﬁdential. Our staﬀ are well attuned to the feelings and processes residents have to work through after admission. You will have questions, you may need assistance or you may simply need to talk through how you are feeling. Our staﬀ are here to help at all times. You will also be given a copy of the Welcome to the Care Centre booklet. There is a great deal that can be done to support you as you settle in and we want to make this phase in your life as smooth and enjoyable as possible. as it provides caregivers and nurses access to everything they need to do for you, on one device. On the day of your arrival you will be welcomed, shown to your new room, introduced to staﬀ and residents, and shown around the care centre. All at your own pace of course. We place great emphasis on really getting to know you. After all, we are caring for you in your home within the village, so learning all the little things – life experiences, hobbies, achievements, preferences – are so important in becoming part of the village family. We will discuss your health and personal care needs with you or your representative, and will develop a plan of care. This will take into account your physical, social, spiritual and cultural wellbeing, your personal needs, and your goals. Rest assured that at all times you will be treated with the utmost dignity, kindness and respect. The Ryman Care Difference The questions you should ask Does the village provide resthome, hospital and dementia care? Will I have a private ensuite? Do menus provide choice, cater for special dietary requirements and are they made fresh on-site? Are there emergency generators installed at the village? Are there complimentary activities and exercise programmes provided throughout the week? the majority of villages, hospital and dementia care. choices including a vegetarian option, that are made fresh on-site by village chefs.  Yes, all our village centres, serviced apartments and care centres have emergency generators installed, so that facilities and systems can run seamlessly even if the mains power goes out. and exercise programmes are held throughout the day, 5-7 days a week. There are interesting outings in the village van, concerts and Happy Hours to keep you entertained. Are there real time electronic records located in each private room? Is there an electronic medication system used so that medication is dispensed accurately? Is there an ongoing leadership programme that provides training and support for leaders throughout the village and organisation? Does the care centre provide free Wi-Fi for residents and their families? Is there an individualised plan of care that is unique to each resident? Are the courtyards, gardens and atriums well maintained? and contain a detailed history of each resident. programme, provides ongoing development and support for Ryman staﬀ in all levels of leadership. accessible on the myRyman tablet in their room. Do I need to get up for breakfast? The choice is yours. Most residents have breakfast delivered to their room each morning, but you are most welcome to have breakfast in the dining room with other residents if you prefer. I need to live in the care centre, however my spouse can live independently. Can we still be together? We oﬀer independent living in the majority of our villages, as well as assisted living in a serviced apartment, so you can still be near each other even if your needs are diﬀerent. Do I always have to eat my meals in the dining room? We would encourage you to eat in the dining room as this is an opportunity to connect with other residents. Alternatively, you are welcome to eat in your room if you wish. Can I have my own things in my room? Absolutely, we encourage residents to personalise their rooms as much as possible. It could be a favourite armchair or furniture that lets you can display your prized possessions. This creates comfort in the familiar which will help you feel more at home. How can I attend church services? We have weekly church services at the village with diﬀerent denominations. Can I keep my own doctor? We have a doctor who visits the village 2-3 times a week, but we are happy to arrange for you to keep your own doctor if you prefer. Can I hang pictures on the walls of my room? Yes, this is all part of making your room your own. Our maintenance staﬀ will be happy to carry out the job for you. When can I have visitors? This is your home, so visitors are most welcome any time – there are no set visiting hours. The facilities are available for you to make the most of the space with your friends and family. We just ask that you respect the privacy of other residents. Am I able to venture outside the village? Yes, you can enter and leave the village freely, unless you are a dementia care resident. For security and safety, we ask you to make us aware of when you are leaving. How will my medication be managed? We employ full-time registered nurses. In conjunction with your GP and pharmacist, your nurse will oversee your medication with our electronic medication system 1CHART. Why do I have to pay a fee while I am applying for a subsidy? Your pension forms part of your fee when applying for a subsidy. Until the subsidy is approved we do not receive full funding. You will continue to receive your pension into your bank account until Work and Income advise otherwise. What if I need help during the night? Professional care staﬀ are on duty all night. Call bells can be used in addition to the night checks conducted by care staﬀ. We do not charge you full private fees for the ﬁrst 8 weeks while you are applying for a subsidy, unless your subsidy is not approved. Fees and costs What is a personal contribution? This is the sum that Work and Income calculate you are required to contribute towards your fees. Work and Income will be able to explain how this has been calculated and can discuss any concerns you may have. Will I still receive my pension? If you receive New Zealand Superannuation, Veteran’s Pension or beneﬁt, most of this will go towards your care. You can keep a personal allowance, and will also receive a clothing allowance. This is determined by WINZ. How long will it take for my subsidy to be approved? It is important to submit your application as soon as possible and to respond to all requests from Work and Income promptly. On average, Work and Income approve a standard subsidy application in 4 weeks. Our villages Ryman Healthcare has over 30 retirement villages across Australasia with their own distinctive personality and welcoming community. Choose the one thatâ&#x20AC;&#x2122;s perfect for you! Membership of associations HealthCare New Zealand New Zealand Aged Care Association Retirement Villages Association of New Zealand Inc.